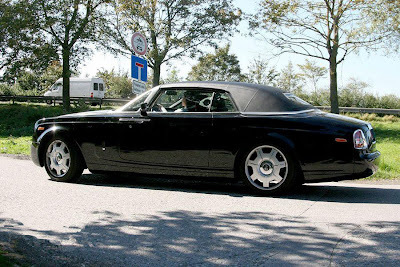 The Bentley B2 by Pininfarina was the first ever non public coachbuilt Bentley Special ordered by the Royal Family of Brunei. 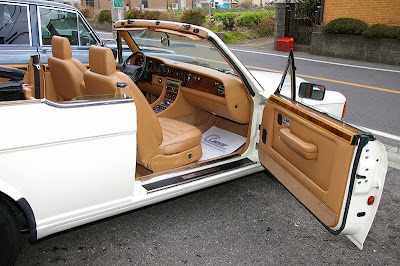 The Bentley B2 was coachbuilt on the Continential R chassis what were made from 1994 till 1996. 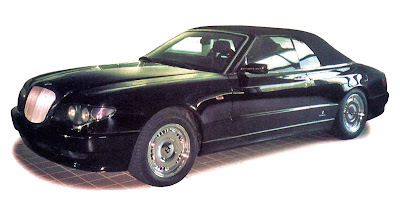 It is a re-bodied Bentley Azure. The first to be commissioned was SCBZB04C5RCH52042 Bentley B2 and has registered in the United Kingdom with number plate M1 STY. 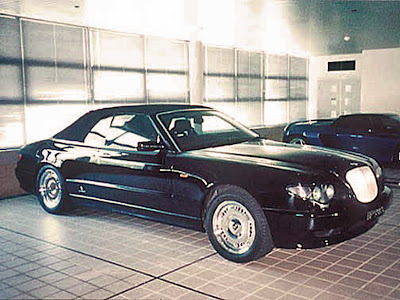 Three were made in 1994, ten is 1995 and four in 1996 bringing the total manufactured to 17 Bentley B2's. 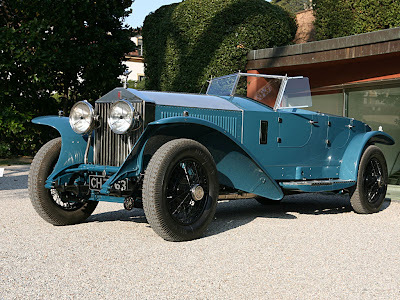 The Bentley B2 was constructed around the same time as the Bentley B3 which was also designed by Pininfarina. 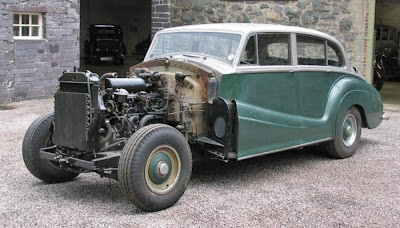 Chassis numbers were often sequential of the B2 and the B3, for example CH52434, CH52435 and CH52436 where Bentley B2's, followed by CH52437, CH52438, CH52439 and CH52440 where Bentley B3, then CH52442, CH52443 and CH52444 Bentley B2. 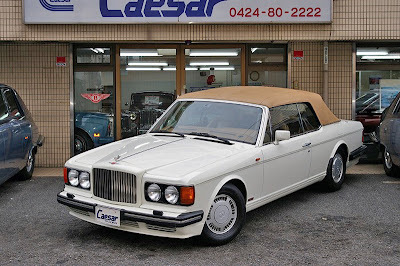 This indicates that the Royal Family of Brunei commissioned Pininfarina to design the Bentley B2 and the Bentley B3 at the same time, where the Bentley B2 was a re-bodied Azure convertible, and the B3 was a re-bodied Continential R.
The Bentley B3 was manufactured by Coggiola S.p.A and it is unknown if the Bentley B2 was manufactured by them as well, but it is unlikely. 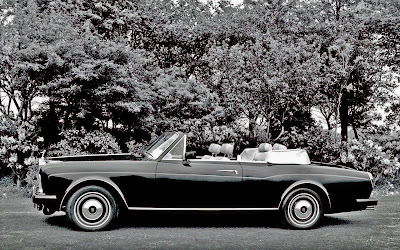 Pininfarina are known for the construction of convertibles, and it is probable that there were made in house at Pininfarina. 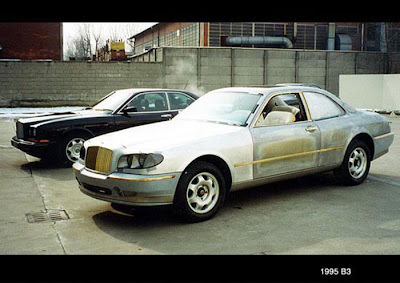 Coggiola S.p.A released photos of the Bentley B3 being constructed, so if they were constructing the B2 at the same time, presumably they would released photos of that car as well. 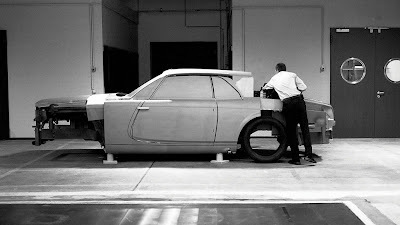 Here is the Bentley B3 by Pininfarina at Coggiola S.p.A being rebodied from a Bentley Continential R.
Read more about the Bentley B3 in a previous post here. 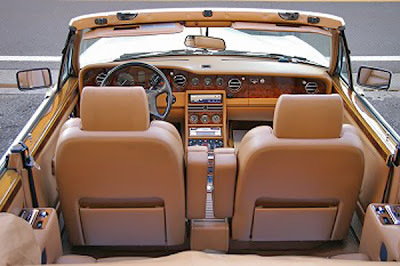 The design of the Bentley B2 and the Bentley B3 however are different. 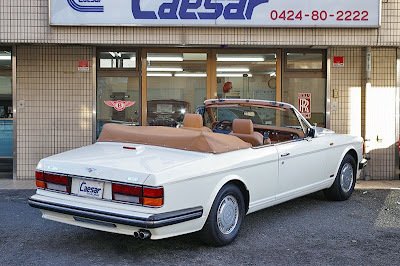 It is not just a matter of one a convertible and other hardtop. 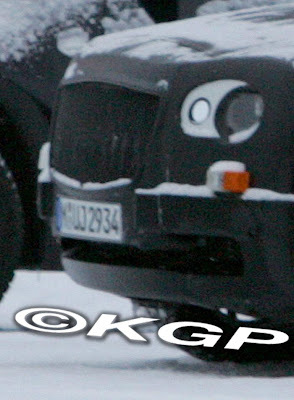 The grill varies between cars, as does the headlights and bumper bars. Here is a comparison. Click image to enlarge. 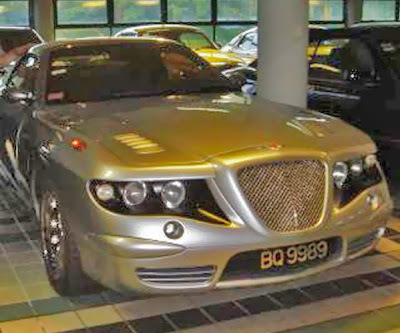 Now lets compare to the Bentley Silverstone, another coachbuilt Bentley for the Royal family of Brunei. 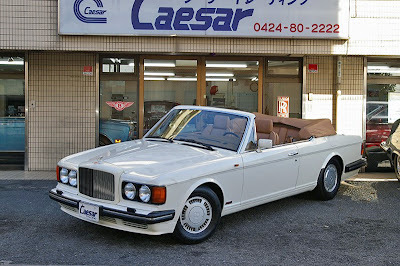 The front is of s similar design to the Bentley B2 and that of the Bentley B3. 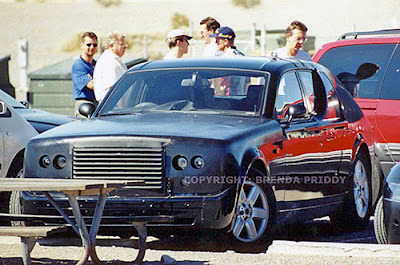 It is currently not known who designed the Bentley Silverstone. Bertone, Zagato, Pininfarina, Italdesign, Ghia, Marcello Gandini and Mulliner Park Ward are all possibilities, hopefully the car will pop up in a design portfolio somewhere! 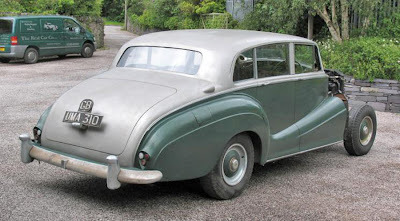 Here is a complete list of all Bentley B2 cars that were manufactured. Only the first was registered in the UK, the rest in Brunei. Now for the most clear picture currently available of the Bentley B2. 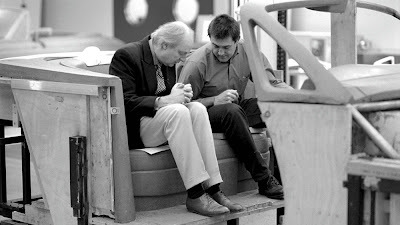 If more pictures or information about this very special car are discovered, they will be posted. Now here are some photographs you do not see every day. The first is of W.O. 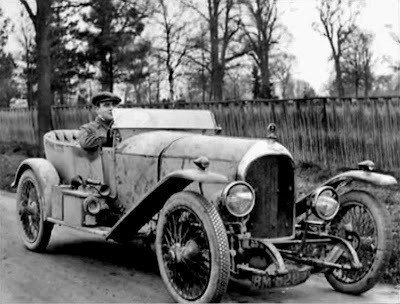 Bentley driving his first ever car. The second photograph is most likely A.E. Claremont, Henry Royce's partner in Cooke Street, Manchester driving one of three Royce 10HP cars. 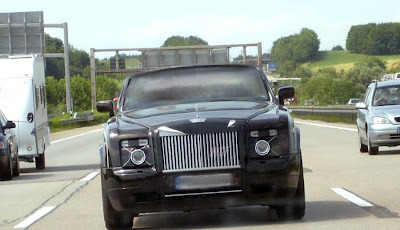 The other gentleman riding shotgun looks seriously bored. I think someone should offer him a cup of tea. 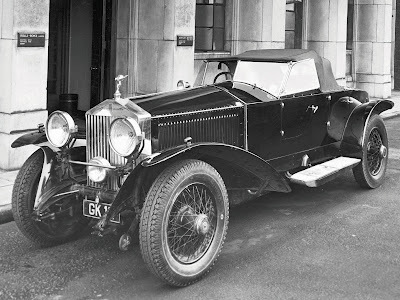 Royce made each part in triplicate, where registration number N 414 was actually the second car constructed after Henry Royce's first with registration number M 612. 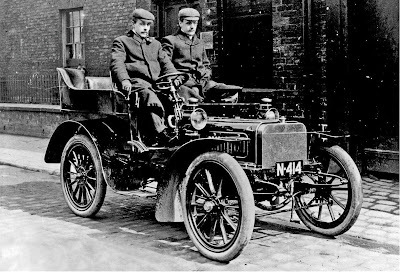 The Royce 10HP registration M 612 was later dismantlement by Rolls Royce at the Derby factory in 1923 as it was no longer needed. Idiots. No Royce cars survive, however one of the engines is in the Manchester Museum of Science and Industry. 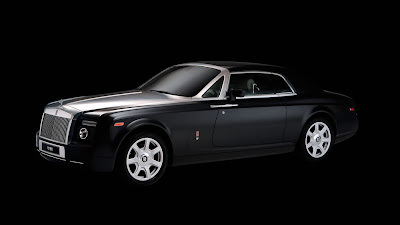 More on vintage Rolls Royce and Bentleys here. Experiments tend to have a lure of excitement about them. The outcome is yet to be known. Totally futuristic, but what is the hypothesis? 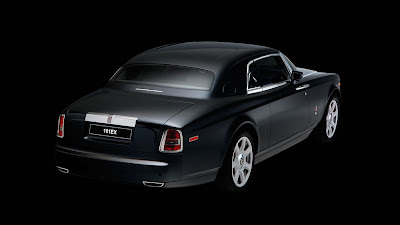 Rolls Royce and Bentley also conduct experiments. They make experimental cars to conduct experiments on or even in. Experimental cars are known as they have the unique chassis markings of 'EX', as in EXperimental. 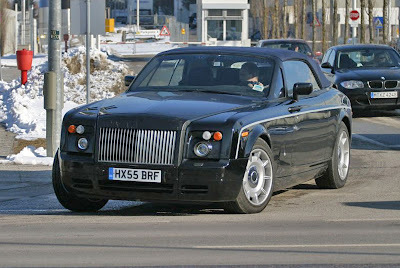 Here is the first Rolls Royce Experimental car. It is the 1919 chassis number 1EX based car based on a Silver Ghost chassis. I'm not sure if it still has test tubes in its boot. Chassis number 10EX was used to try and break the 100mhp barrier at Brooklands to knock off the Bentley boys. They made it to 86mph before it was back for more experiments. Below is the 1927 16EX car also based on the Silver Ghost, with either Hooper or Baker coachwork. It is a high resolution photograph out the front of Rolls Royce and Bentley. Click to enlarge. 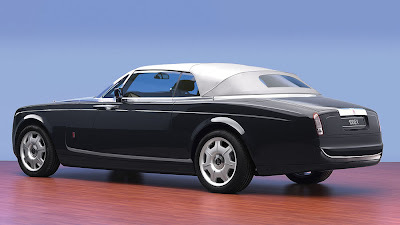 The next is the Rolls-Royce 17EX with Jarvis coachwork called the Torpedo. It spent most of its like in India, before being discovered and restored. More on 17EX can be read about here. In 1958 45EX was made, then there was a break in numbering experimental cars. However experiments still went on. Lets take a look at some more modern EX cars. 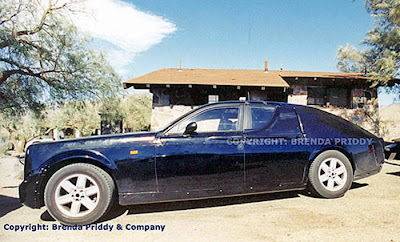 This could well have been 99EX, the experimental car based on the new Rolls Royce Phantom chassis from 2002. The scientists are well, out conducting experiments. Seriously. 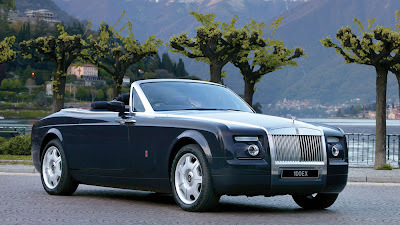 Then celebrating 100 years of Rolls Royce the numbering of experimental cars started up again with 100EX. There could well have been 55 experimental vehicles based on the Silver Clouds, the Phantoms, the Silver Shadows, the Silver Spirits and the Silver Seraphs. They just forgot to number them. Now the very well known 100EX. These photographs are a bit too posed though and do not remind me much of a high school test lab. What I like is to see the scientists out on the street conducting experiments on the experimental cars. Here are some shots of just that. The headlights are different on this car, testing testing. In the car biz they are known as spy shots. 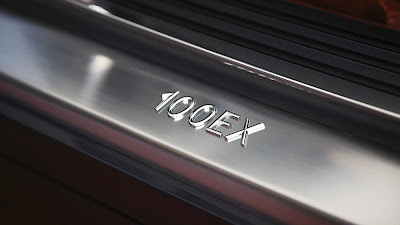 Now the next experimental car, the 101EX. The fixed head coupe version that will be on sale soon. I am not going to comment on the fibre optics roof. No comment. 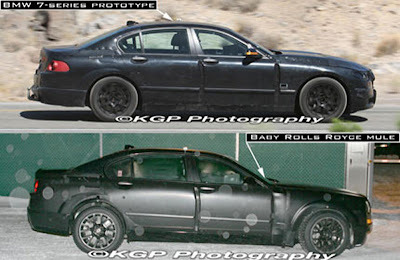 Here is one testing, it has a fake cloth roof over the hard top to disguise it. Want to see the start of 102EX? Sure you do. 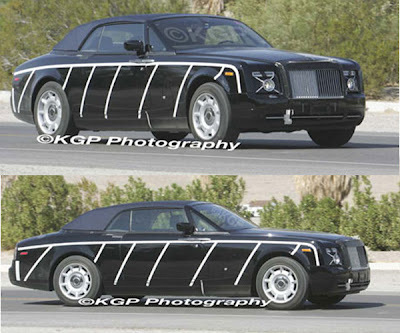 This is the test mule for the new baby Rolls Royce that could be called the Silver Shadow, and also may be known as the Next Generation Saloon. The photos are pretty hard to come by. They were taken this week at the BMW cold weather testing centre. They are very much still experimenting. Do you want one for your collection? How about 41EX from 1955. Well buy it for £15,000. The Real Car Co in the UK has 41EX for sale and the advertisement is here. I quote from the ad. 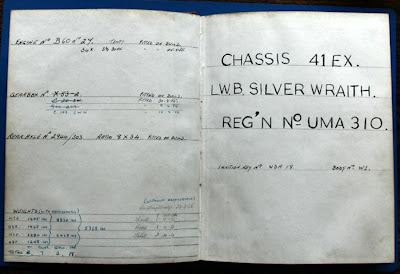 "A Park Ward Touring Saloon, being one of a small number of cars used by the factory for testing purposes, and allocated a special chassis number as a result. 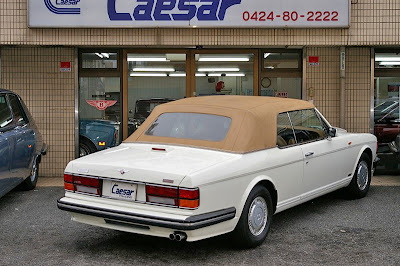 After about 11,000 test miles in the first 18 months of its life, the car was retained by Rolls-Royce and used for various purposes, including a period with the School of Instruction, and not disposed of until 1979. It then went to Ian Rimmer, author of the book on the experimental cars, from whom we have acquired it, thereby making it a two-owner car! A desirable 4.9 litre engined car, with power steering and air conditioning. 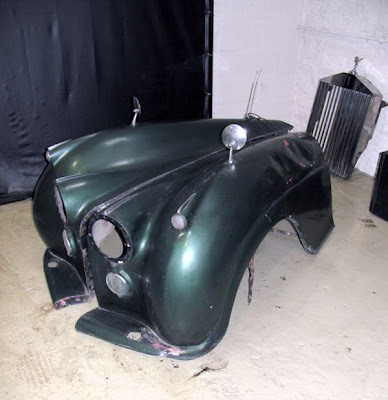 Unused for 25 years and in need of restoration, but very sound, complete condition, and a very worthwhile project." Now a snippet on the owner. "Born in 1940, Ian Rimmer started his professional life in the aircraft industry and in 1967 took a career change & joined the Rolls-Royce Car Division. 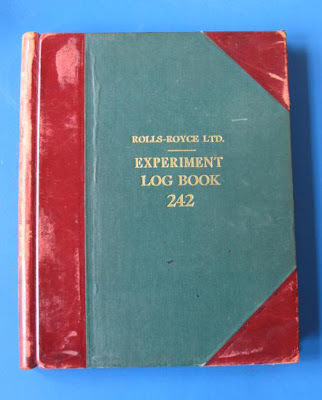 During his spare time whilst at Rolls-Royce he spent some 16 years researching the complete range of experimental cars resulting in the publication of his book in 1986. 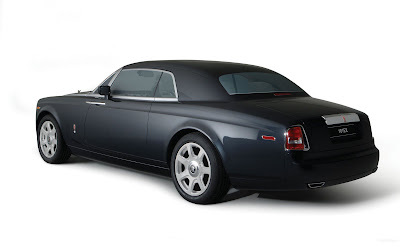 Ian remained with Rolls-Royce until his retirement in 1999 & in 2005 became Chairman of the RREC." The car would certainly make an interesting talking point. How cool is this! Lab book included! An amazing piece of history to accompany the car. Test tubes not included however. Lets play a game. Bentley Spotting. 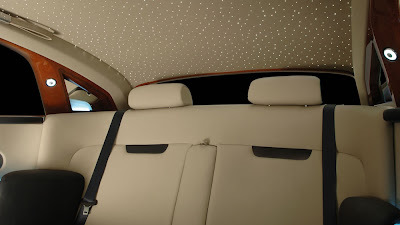 Well, guess the Bentley. Many people will find this picture familiar. Some may know the model and year. 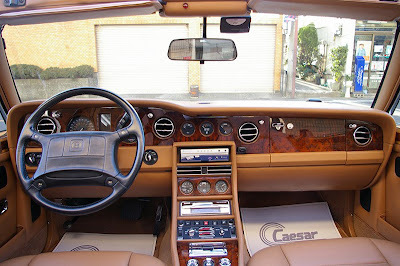 Four air vents, three on the tree column shift, centre console instruments etc. Now the second. Sure you have seen the dash from this distance before. Not. Now the whole of the behind. Guessed it? It is the very rare Bentley Azur 2 Door Spyder by Jankel. Yes the Azur, pre-empting the Bentley Azure based on the Bentley Continential R was this coachbuilt Bentley Azur based on the Bentley Turbo R. More on the Bentley Azur by Jankel here. 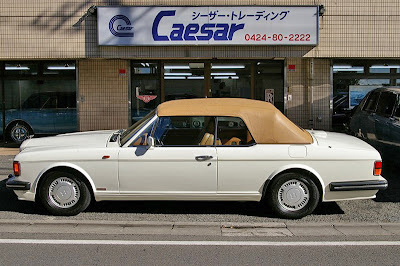 The advertisement for the car is here, and a translated version into English can be read here. The translation is not the best however, but readable. The ad goes on a lot about the history of Jankel. What is more interesting about the advertisement is that it states the dimensions of the car. The original Jankel sales brochure only stated that the car was a short wheel based car. The car according to the ad is actually 2 centimetres shorter than the standard Turbo R, at 526cm compared to the standard 528cm. The door dimentions are also noted. The standard front doors of a Turbo R are 130cm, but on the Azur by Jankel the doors are stretched to 170cm. It does allow enough room for your girlfriends to get into the back. 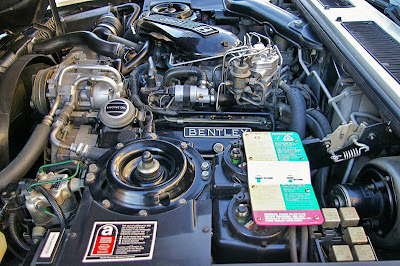 The car is immaculate, including the engine bay. Certainly very well looked after. The lid takes 17 seconds to open electronically, and 21 second to close. 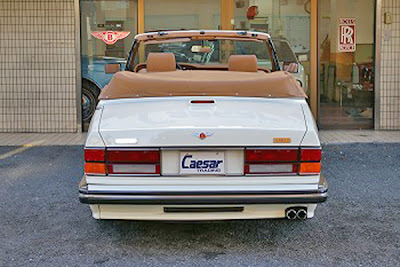 I better add it to the now 19 different Turbo R / Silver Spirit based convertibles in a mega gallery here. 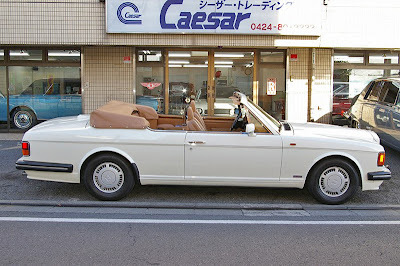 Thanks AJ our regular Bentley spotter in Tokyo for the tip. 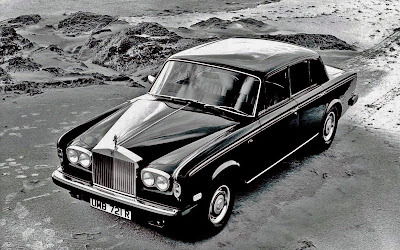 From the Rolls Royce enthusiasts club's archives comes the Silver Shadow range. 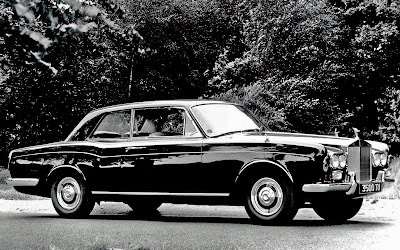 The Rolls Royce Silver Shadow. In high resolution of 1600 x 1000. Click on the image for full size. Great for desktop images, or poster prints. 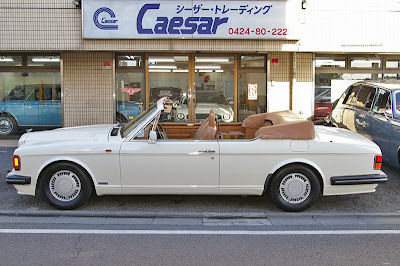 The Rolls Royce Corniche fixed head coupe. 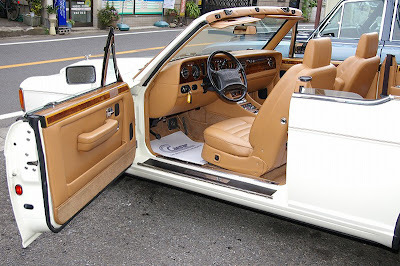 The Rolls Royce Corniche drop head coupe. I have been unable of obtain a high resolution James Young two door yet, but one will hopefully surface soon.